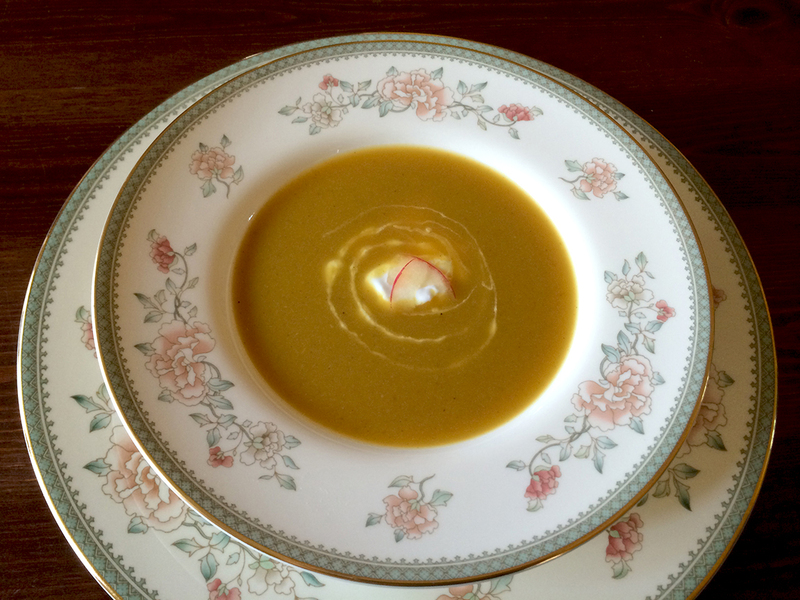 Soup prepared any time of the year is a welcome repast in our house. One of the things I love about soup is the infinite variety of tastes and textures that it can provide. Whether hot or cold, savory or sweet, thick, chunky or thin…all soups say “comfort” to me. Spring is here, the trees are blooming and my hellebores are having a banner year. The daffodils and tulips have been in full glory this week and even the azaleas are showing a little color in their buds. Our temps have ranged up to 80 degrees F on and off for the past few weeks and we’ve enjoyed spending a few nights grilling out on our deck…when it hasn’t been raining. Today is another beautiful day—but cold, and it’s due to go back down to freezing tonight. Seems like a perfect time to make a warming pot of soup! This recipe features butternut squash with a good bit of spice. Richly colored and flavored, but light in texture, this savory curried butternut squash soup is fast and easy to make during the week, and can stand alone or be served with another dish. The depth of flavor comes from roasting the squash, onion and apple until they are tender and just caramelized, causing the “meat” of the fruit and veg to easily release from the peel. Then I mash them right in the soup pot, adding some light coconut milk, chicken or vegetable stock and a few warm spices. Heat it all up and cook just long enough to blend the flavors, then give it a whiz with a stick blender and it’s ready to serve. I’ve said it before and I will say it again, like most soups, this one tastes even better the next day. 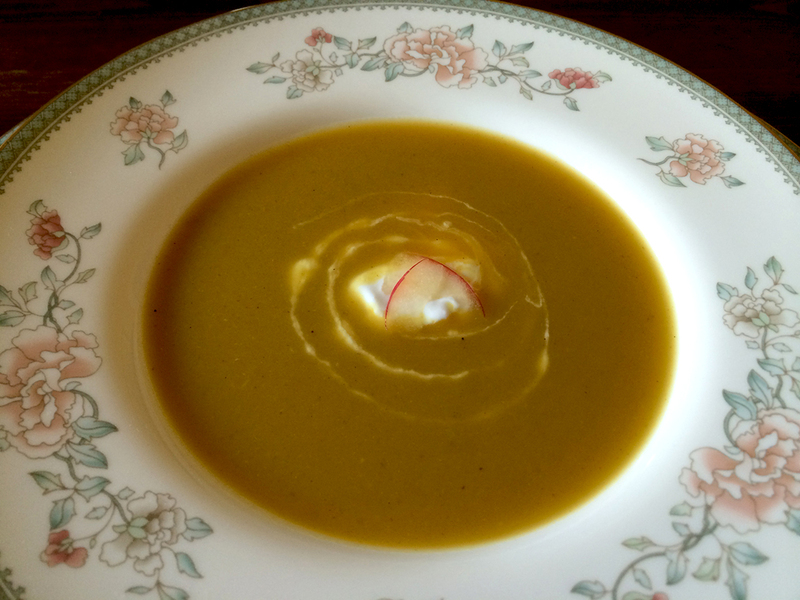 I love to serve this soup with a dollop of Greek yogurt swirled on top and garnished with a thin slice of apple for a light lunch. For a heartier meal or dinner, I often pair it with a simple green salad topped with some fruit, toasted almonds, some shavings of a rich hard cheese and a light vinaigrette. Or better still, and if you have the time, it’s simply stunning with a hot grilled cheese and thinly sliced apple panini. Heat oven to 350 degrees F. Cover a cookie sheet in aluminum foil and spray it with non-stick cooking spray or lightly coat with canola oil. Sprinkle the 1 teaspoon of olive oil over the cut sides of the vegetables and fruit evenly, using your hands to coat each piece well. Place the squash, apple and onion cut side down on the aluminum foil and roast in the oven, watching carefully, until the skins are slightly blistered and pulling away and the veggies and fruit are tender when pierced with a fork—about 15 – 20 minutes for the apple and onion and another 10 – 15 minutes for the squash. When the fruit and veggies are tender, remove them from the oven and transfer to a plate to cool for about 5 minutes, then carefully remove the meat from the skins, discarding the skins, and place it into a large stock pot. Using a potato masher, mash all the vegetables to combine them, then add the coconut milk, chicken or vegetable stock, salt, curry powder, cayenne and Chinese five spice and stir well. Heat to a boil, then reduce to simmer and cook for about 10 minutes. Remove the pot from the heat and carefully puree the soup with stick blender until smooth (or in batches in a traditional blender then return the soup to the pot.) Return the soup to the stove and heat just until warmed through. Taste the soup and add any additional salt as needed, to taste. Ladle into bowls and garnish with a dollop of yogurt and a paper thin slice of apple, if desired. Note: We happen to like curry in our house so this recipe as written has a strong curry flavor. You may cut back on the curry if you like, and the recipe will still make a wonderful and flavorful soup. 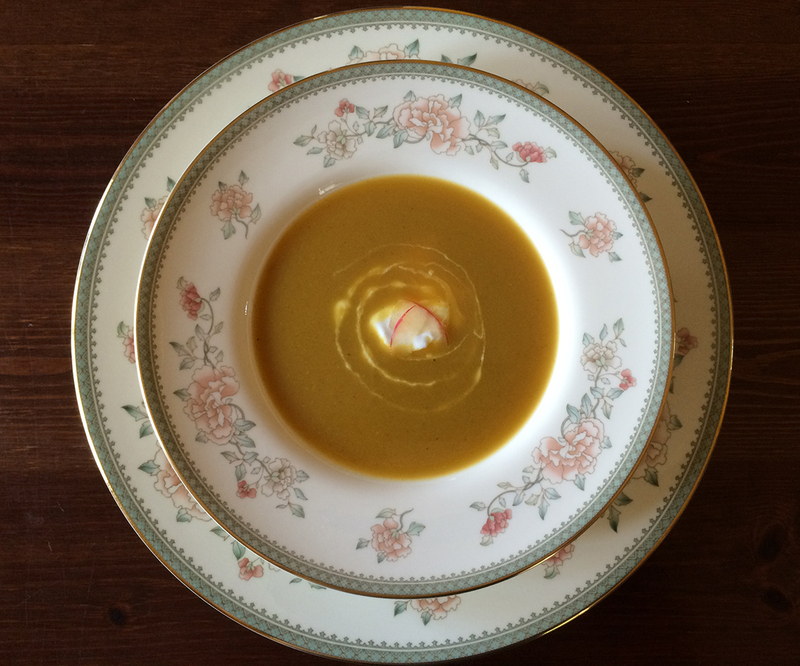 If you truly do not like curry, take a peek at my Asian-Inspired Butternut Squash soup…very similar, but no curry. This entry was posted in Food, Soups and tagged apples, Butternut Squash, Butternut Squash Soup, Coconut milk, Curried Soups, curry, Savory and Smooth Soups, Vegetarian by bitsandbreadcrumbs. Bookmark the permalink. I could surely use a large bowl of your delicious soup. Would you believe we had snow flurries on and off the whole day today? Will be in the teens tonight. Happy to learn that spring has arrived in your part of the country and your spring flowers are in their full glory. My helleboros is going to be blooming very late this year. Thank you Charlie Louie, that is my fine china, and I’ve loved it since I picked it out at age 16! 🙂 You are well and truly entering soup season there and butternut pumpkin sounds amazing. What a lovely combination Betsy and perfect since it’s still dreary and wintery and cold and rainy and windy. At least it’s not snowy…yet. I’m sorry your weather is still so winter-ish. We did slip down to freezing but fortunately it didn’t stay there long enough to nip the azalea buds. It’s 71 here right now, but due to rain again. Sorry, I didn’t comment on the recipe as such…I love that you added coconut milk which will temper the strong curry flavour without obliterating it, it’s a wonderful combination that we have used a few times. That’s okay, Eva, but I do really appreciate your commenting again! 🙂 So glad you like the combo of flavors. Curry and coconut milk are a favorite of mine and butternut seems to go so well with them. First time visiting your blog. All the recipes I’ve seen so far look scrumptious. You have my follow, hope to read more from your blog! Easy and curried, you don’t have to say more words! Hi Betsy – Happy Spring…even though it’s still cold! I know I’m going to love this curried squash soup. I’m really into anything that has ‘curry’ in the name lately. And I recently bought, for the first time ever, some Chinese Five-Spice Powder…. I have the apples etc. – I just will have to run out to get some squash. (Butternut is, far and away, my favorite squash.) I’m ‘pinning’ this but I’m also printing it ’cause I want to make it this week. Great post – as always!! Thanks so much, Cecile. And I think you’ll really like the Chinese Five Spice. I put it in chili, too…it really adds a lot of flavor and a little bit goes a long way! Hi Cecile, those are just opening hellebores or Lenten Rose. We have a ton of them in the yard. Now all of our azaleas are blooming and the trees are leafing. This is a quick Spring! Oh – you said your hellebores had recently opened – they’re lovely!! And we seem to be sooo far away still from our azaleas blooming etc. I NEED SPRING !! ++ Going to check out ‘hellebores’ !! Perfect dish for the transition season! Thank you Sophie. That’s my fine bone china, a pattern I picked out when I was 16…a very long time ago!